Rick Shaw of Rick’s Smokin’ Pig is not only competing in the Brenau Barbecue Championship but is selling his barbecue to patrons during the festival on Saturday as well. Two teams competing in this year’s Brenau Barbecue Championship will also be selling their pork to hungry visitors at the event. But it’s almost by accident that either team exists. Rick Shaw of Rick’s Smokin’ Pig in Gainesville said he’d been smoking chicken, pork and steaks since the 1960s. But after tasting success with a first runner-up finish for pulled pork in the inaugural Brenau barbecue event, Shaw decided to open a restaurant on John Morrow Parkway in Gainesville. 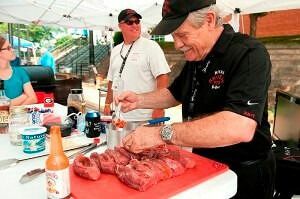 Rick Godfrey of Dixie Que BBQ in Macon said his first attempt at competitive cooking didn’t go well. But the failure spurred him to learn more about cooking techniques and cuts of meat. Now his team is a regular winner on the barbecue circuit. Both Smokin’ Pig and Dixie Que will sell pork plates and sandwiches to customers on Friday and Saturday at this year’s Brenau Barbecue Championship. Both will also be competing in the competition, where they have previously won awards. Choosing the vendors who’d be allowed to sell to the public was a deliberate process, said Jim Barco, coordinator of the Brenau Barbecue Championship. “You want to look at who does barbecue, but more importantly who does barbecue well,” Barco said. Barco said both teams will make world-class barbecue for sale, and he’s particularly proud that a local team was chosen. Shaw said he’s grateful for the opportunity. He credits his team’s success in the 2009 Brenau Barbecue Championships for his decision to open a restaurant. The Brenau Barbecue Championship begins with a preview party from 6 to 10 p.m. on Friday, May 24. Tickets to the preview are $10. The main event is Saturday, May 25 starting at 10 a.m. Saturday admission is $5 and kids ten and under are free. Both days feature music by local artists, family friendly activities, and a car show Saturday afternoon. For more information on the Brenau Barbecue Championship, including a schedule of events and directions, visit brenaubbq.org and find us on Facebook at facebook.com/brenaubbq.